At last!! It gives me the greatest pleasure to announce the emergence of our instructional recording of The Yoga Sūtras of Patañjali, Chapters Three and Four!! 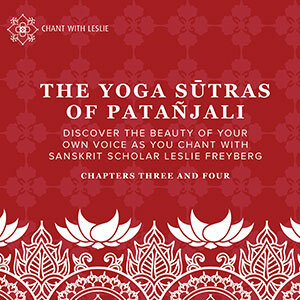 As in the same format as Chapters One and Two, this recording is designed to enable every listener to listen, repeat, and recite for him and herself, every sound in the remaining two chapters of this time-honored text devoted to teaching us how yoga can help us in our lives. In addition, the “other” Invocation to Patañjali ( “Yastyaktvā” ) is included in the call and response format.